The Creative Kit 2016 applications are not all aimed at the same users or level of expertise, but they fit together nicely and offer excellent value for money. In particular, they give you great ideas for photo effects and enhancements, many of them quite advanced, but delivered in a fun and painless way. MacPhun is a relative newcomer to the Mac image-editing scene, but it's not wasting any time making a name for itself. 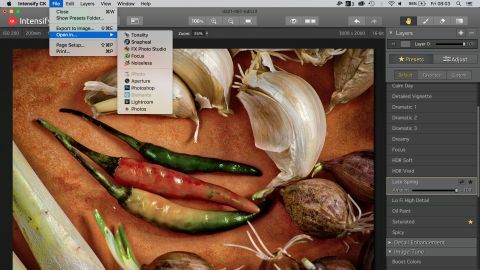 It started out by selling its image-manipulation tools individually via the Mac App Store, with Pro versions delivered straight from its website, but these have now been scooped up into a single Creative Kit 2016 package which offers big savings over the individual prices. The kit includes Snapheal, a simple but powerful object removal tool, FX Photo Studio for easy one-click image effects, Intensify for dramatic localised contrast effects, Focus for bokeh and depth of field effects, Noiseless for high ISO noise removal and Tonality for beautiful black and white and vintage effects. MacPhun's apps offer a wide range of preset effects for enhancing your photos. There are actually three editions of the Creative Kit at the time of writing: Starter's Edition (but this only comes with Snapheal, FX Photo Studio and Intensify), Complete Kit (tested) and Pro Kit Premium, which comes with training materials. All of these programs can be launched and used as standalone applications. The Creative Kit versions also integrate, so apart from saving the image or sharing it via email, Facebook and so on, you can send it straight to one of the other applications in the Creative Kit suite. When you've finished in one app you can send your image straight to one of the others for any further enhancements. More than that, though, the CK applications also work as plug-ins for Lightroom, Aperture, Photoshop and Elements, so that if you already have a favorite image-editing tool, you can still use the MacPhun apps for additional creative inspiration or for jobs which would be just too long-winded or difficult in your regular software. So those are the basic principles – now let's take a look at the individual applications.